Oct. 7 — Income tax considerations are taking center stage in many estate-planning strategies, wealth planners told Bloomberg BNA. The reasons behind this trend? A spike in income tax rates, a decline in the estate tax rate and an increasing annual estate tax exemption threshold. “There’s been a definite narrowing of the gap between the income tax rates and the estate tax rates,” said Steven Lavner, a managing director in the National Wealth Strategies Group at U.S. Trust, a subsidiary of Bank of America Corp. This trend has resulted in a shift in estate-planning strategy in the last two to three years, he said. The estate tax has moved to a maximum tax rate of 40 percent and a $5.45 million exclusion in 2016, from a 55 percent tax rate and a $675,000 exclusion in 2001. The maximum tax rate on ordinary income is now 39.6 percent, up from a low of 35 percent in 2003. 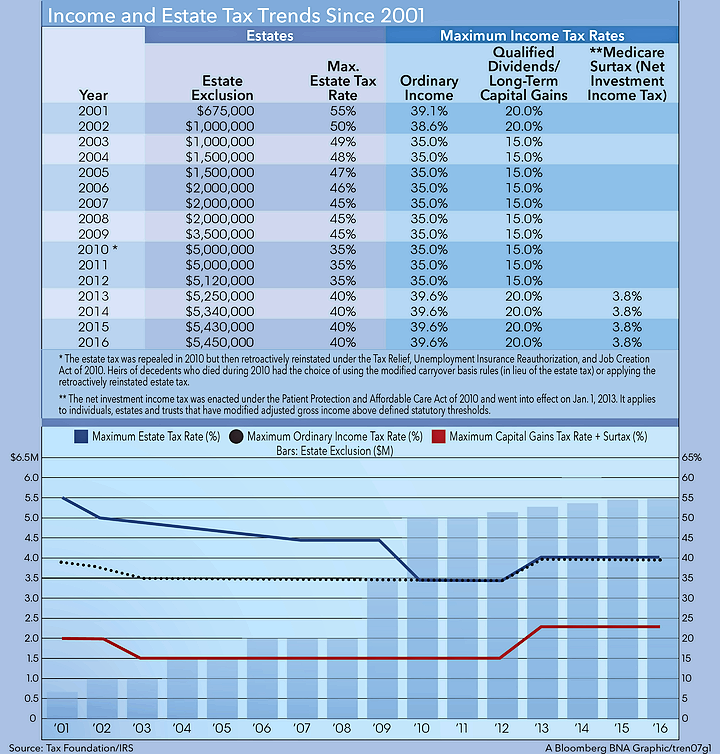 The maximum long-term capital gains tax rate increased to 20 percent from 15 percent in that same time frame, and in 2013 an additional 3.8 percent surtax was added for certain net investment income of individuals, estates and trusts over statutory threshold amounts. Regarding estate planning, the capital gains tax rate—which Lavner described as the long-term rate of 20 percent plus the 3.8 percent surtax—is especially significant because it affects the basis of assets. When a decedent dies, his or her beneficiaries get the benefit of what is referred to as a step-up in basis, meaning appreciated assets held in the decedent's estate are readjusted to fair market value at the time of inheritance. This provides an income tax advantage because the beneficiary isn't liable for the capital gains tax on any appreciation that occurs up to the point when he or she inherits the asset. Lester B. Law, managing director at Abbot Downing, agreed. “I would venture to say that if you’re in private practice, you probably have 30 percent or 40 percent of your clients that are currently taxable under the estate tax, where you may have had a number of 90 percent plus” in the past, Law said. “But we all know that all of our clients are subject to the income tax,” he said. Aucutt said he began to notice a change in 2001 when the Economic Growth and Tax Relief Reconciliation Act (Pub. L. No. 107-16) gradually lowered estate tax rates to 45 percent and ultimately increased the exemption amount to $3.5 million. The anticipated inflation-adjusted estate tax exemption amount for 2017 is $5.49 million per individual, according to a Bloomberg BNA report released Sept. 16. For a married couple, that amount is doubled to nearly $11 million. Robert McClelland, a senior fellow in the Urban-Brookings Tax Policy Center, noted that in the mid-1970s there was a peak in the number of estates subject to the estate tax. About 7.5 percent of people who died had a taxable estate, he said, and that number has decreased to about 0.2 percent with the high exemption amount, he said. “By and large, $11 million will cover most people,” said Cynda C. Ottaway, a director of the Wealth & Closely-Held Business practice at Crowe & Dunlevy. “And that’s when I saw a real shift of ‘OK, if you don’t need plan against the estate tax, we can still help you avoid big mistakes regarding transfers of appreciated assets,' ” she said. Because of the high exemption, planning may be very simple for most people, Lavner said. They could just hold onto their property, die with it, not have to pay estate tax and get the step-up in basis, he said. For the small number of estates subject to the tax, Lavner said the question becomes: Is it worth it for them to make gifts in estate planning, or should they also hold onto the property and just die with it? Lavner said it is generally more beneficial to make a lifetime gift with an asset that has a high basis, or little appreciated value. That way, the donor avoids estate tax on the asset because the asset has been removed from the estate, and the carryover basis takes the high basis and puts it in the recipient's possession. Because the asset hasn't appreciated much, when the beneficiary is ready to sell, he or she will likely recognize a lower tax on the capital gain, he said. Conversely, if a person has a low basis asset—one that was purchased at a low value and has appreciated significantly, such as stock in a successful tech startup—that person may want to hold onto the asset until death in order to get the step-up in basis and prevent the beneficiaries from having to pay a high capital gains tax, Lavner said. State income and estate taxes—which can differ from state to state—also need to be considered when discussing wealth-planning strategies with clients, he said. For example, New York has a state estate tax in addition to the federal tax, while California doesn't, so estate tax considerations may carry more weight in New York. The trend of increasing income tax rates and a greater focus on basis and capital gains has forced law firms to become more creative with planning techniques, Law said. At a District of Columbia Bar event in September, Law and his colleague Patrick E. Beaudry, a director of Wealth Planning at Abbot Downing, offered details on a planning tool known as the Power of Appointment Support Trust. The technique was designed so that individuals could take advantage of wasted estate and generation-skipping transfer tax exclusions, now that 99.8 percent of decedents are no longer subject to the estate tax, the attorneys said. The POAST is an irrevocable dynastic grantor trust that benefits downstream beneficiaries—children—and upstream beneficiaries with modest wealth—parent or grandparents. In simplistic terms, to use the strategy a person would transfer assets to a POAST for his or her parent, which may trigger an upfront gift tax. The parent is granted a testamentary general power of appointment equal to his or her remaining estate and GST tax exclusion at death, according to the attorneys' presentation. This results in the assets being included in the parent's estate, as opposed to the donor's estate. As long as the parent doesn't exercise the general power of appointment, the POAST can remain a grantor trust with respect to the trust donor (middle generation). Distributions from the trust are made to the parent for his or her support when needed, and when the parent dies the assets are included in his or her estate, Law and Beaudry said. Those interests would receive a date-of-death basis adjustment, potentially eliminating the income tax on appreciated assets. At the same time, the parent's unused exemption can be applied to the included assets, allowing multiple generations to benefit from the assets without additional transfer tax, they said. In the end “we traded a gift tax for possibly permanent removal” of the assets from the transfer tax system, Beaudry said. While the gap between income tax and estate tax rates has narrowed in recent years, that trend could change with future legislation, Lavner said. Presidential candidates Hillary Clinton and Donald Trump have each put forward an estate tax proposal. “Under Hillary Clinton’s proposal, there would generally be an increase in the capital gains tax, as well as the estate tax,” Lavner said. Clinton's plan would tax estates worth between $3.5 million and $10 million at 45 percent, estates valued at more than $10 million at 50 percent, estates of more than $50 million at 55 percent, and estates over $500 million at 65 percent. Conversely, “under Donald Trump’s proposal, there would generally be an elimination of the estate tax, and a new tax on capital gains at death” for estates above a $10 million exemption threshold, he said. “It is far too soon to predict what form of new legislation, if any, might ultimately be enacted,” Lavner said, but either proposal would likely impact estate-planning trends.